Only at Universal Orlando Resort can your child come play with Barney and his dinosaur friends. This show is a family favorite for anyone with children. Real life Barney, PJ, and Baby Bop will take the stage for a whirlwind sing and dance-a-long. While singing and learning about the four seasons, the entire theatre will transform to take you through Summer, Fall, Winter, and Spring. Parents will love the chance to cool off and watch their little ones’ eyes light up. Finally just when you can’t think it can’t get any better join Barney and his friends in the indoor Barney’s Backyard! Barney’s Backyard is an indoor playground, it is a little on the smaller side. However it is designed to resemble a dream park full of lush trees, beautiful flowers, and benches for mom and dad. The indoor park also includes an array of educational toys, a sandy area for play, an echo tunnel, and even a musical fountain! After the show Barney, PJ, and Baby Bop will make an appearance here. This is a great time for a family photo and an autograph for the youngsters. 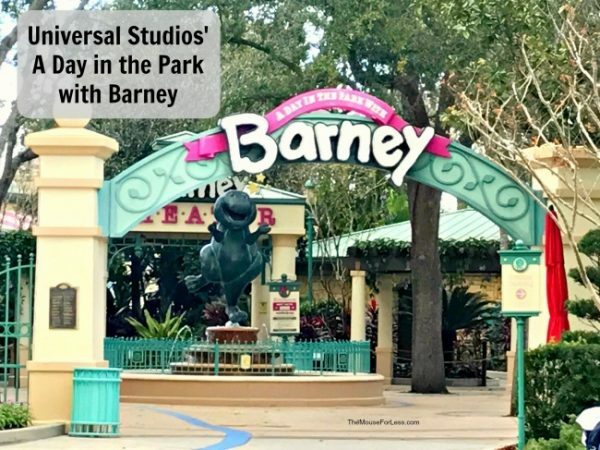 A Day in the Park with Barney does not accept the Universal Express Pass, but if you aren’t the first person in line don’t fret. This theatre is specially designed so the seats are shaped around the stage. This way everyone will be close to the action. If you are a planner you can count on the first show beginning at 11:30am, then continuing every hour to hour and a half. Each show runs about 25 minutes + play time in Barney’s Backyard. Since A Day in the Park with Barney is a show for young children there is nothing that should spook your little one. Although be aware that there will be a few short moments of complete darkness as the seasons change, and just as Barney begins to teach all about imagination. Come to the show during the holiday season to watch as A Day in the Park with Barney becomes A Barney Holiday.